SILVER SHALIS is a Loading... luxury yacht, built by Delta Marine and delivered in 2010. Her top speed is 20.0kn and her power comes from two 3650.0hp MTU 16V4000M90 diesel engines. 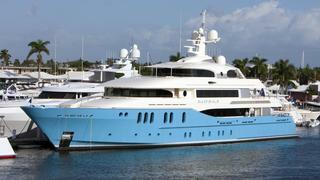 She was designed by Langan Design with Delta Design developing the naval architecture, and the interior design was created by Jonathan Quinn Barnett.